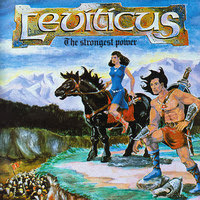 Originally released by Pure Metal Records (US Version) in 1985, The Swedes of Leviticus and 'The Strongest Power' received international acclaim when Kerrang called it a powerful, direct and passionate platter and finished the review by calling it one of the best records of the year? Back then dodgy music journalists ruled the world and people had to believe them by their words since you couldn't exactly rush to the computer and check for yourself on the internet. False prophet or the word according to the gospel? Keeping in mind that 1985 was a pretty average year in hard rock and metal (at least in comparsion to 83' 84' and the following years), this is indeed a rather decent release if you appreciate the Christian sub-genre. Now re-released by Ektro Records and remastered by guitarist and songwriter Björn Stigsson, you'll notice a slight different to the sound. Truth be told, this was a pretty raw recording in the first place and the opening two songs (The Winner, Deborah and Barak) are doomy and very loud metal tunes. It's weird as I have always thought of the early Leviticus albums as pretty much their own style and genre. However, much like various other obscure acts such as, Quartz, played basic metal with Sabbath overtunes, but with less menacing vocals and they were more given to melody, these Swedes were steeped in a similar mode (more melody/harmony) as they mixed NWOBHM with the first wave of Swedish Christian Hardrock (Jerusalem) and the melodic yet blunt heavy metal of its era. The odd up-tempo Tokyo Blade style action according to the press-release and why not? Vocalist/bassist Håkan Andersson's roaring bass sound and mid-pitced, rough vocals, definitely an acquired taste. Basically the working class down town singer without the proper upper register. I believe the man borrowed his amp sound from this other bassist/vocalist including warts and everything? Brother Kjell Andersson, the third and final member of the band, the proper drummer with impressive time-keeping attribute, simply check out "I Got Power". Leviticus became more melodic with each following album and I prefer the late eighties version of the band. The Ektro Records remastering comes with six page booklet made up of band photos, a couple of notes, and the concert shot that graced the back cover of the old platter.